It would be unfair to say that when Steven Gerrard slipped in front of the Kop in April of 2014, Brendan Rodgers’ days as manager of Liverpool Football Club were numbered. But the then-34-year-old captain’s untimely error which allowed Chelsea to open the scoring in a 2-0 victory over the Reds at Anfield was the beginning of a downward trend which saw the Reds miss out on their first title in over two decades in 2014, crash out of the Champions’ League in the group stage, fail to reach the final of either domestic cup after reaching the semifinal in both competitions, and finish a lowly sixth in the Premier League last season. So the slip wasn’t the critical moment. But it was certainly a trigger for an avalanche which eventually cost Rodgers his job. After failing to impress in their first few matches of the season – a 1-1 draw against Everton on October 4 – was the final nail in the coffin, Rodgers’ contract was terminated, and the search for a new manager began. One name, linked with the Merseyside giants since the end of last season’s depressing campaign, immediately came to the forefront: the name of a 48-year-old German who used a combination of stalwart defense and lethal counter attacking football to lead an industrious Borussia Dortmund side to back-to-back Bundesliga titles to topple German giants Bayern Munich: Jurgen Klopp. There are few names in European football more synonymous with excitement. Watching a Jurgen Klopp side at their best is like watching an artist paint a masterpiece. 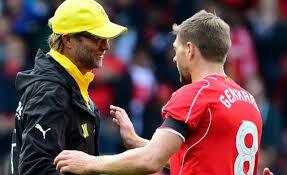 Klopp brings several core values to his side: hard work, communication, intensity and common sense. And those are qualities this Liverpool side need desperately. The side that took the field against Everton last week was a shadow of the team that thrashed the Toffees 4-0 at Anfield just 18 months prior. The departure of star players Luis Suarez, Steven Gerrard and Raheem Sterling didn’t help, but there was more at play than just a lack of starpower. The team lacked intensity, it lacked bite. The side that had cut opposing squads to ribbons looked anything but incisive, and it had a lot to do with their manager’s playing style: or lack thereof. Brendan Rodgers blew us away during that 2013-14 league campaign by adapting his style to suit the needs of the team, whether to account for player injury or suspension, to incorporate young players into the starting lineup, or to adjust the tactics to best exploit the weakness of the opponent. No matter the game, Liverpool always seemed to look the better side: they always seized and maintained the initiative. But a regrouping period after the departure of Suarez left Liverpool needing to break in several new players, not all of whom adapted to the existing playing style. Rodgers fell into a habit of almost constant tactical changes in a desperate attempt to improve results, and this lack of consistency resulted in a general lack of identity, not only for supporters who were left scratching their heads at the decision to leave Steven Gerrard out of the side that faced Real Madrid in the Champions’ League in Spain and the depleted side the team fielded at Wembley in the FA Cup semifinal defeat to Aston Villa. That general lack of identity carried over into the 2015/16 campaign, as the club lost its face when Gerrard left the club to play for the Los Angeles Galaxy in MLS, and Rodgers tried in vain to throw together a squad that could consistently earn positive results. Injuries to captain Jordan Henderson and striker Daniel Sturridge didn’t help the cause, but in the end, the manager takes the fall, and after another disappointing result at Goodison Park sealed his fate. Just days later, Klopp was announced manager, and the similarities between the two managers cannot be stressed enough: both prefer to employ a high-speed, counter attacking brand of football; both are relatively young; and both transformed underperforming teams into contenders. The main difference between Rodgers and Klopp is mentality, the German being the more aggressive tactical leader. And this is not necessarily a bad thing, although it will almost certainly take some time to bring to full fruition. Klopp is the champion of gegenpressing – counter pressing, in English – and it may be the key to Liverpool’s resurgence. Gegenpressing is more than a simple counter attack, it is a full-on assault of the opponent after losing possession. It can take multiple forms: pressing high to mark all forward passing options and force the man on the ball to play the ball backwards; attacking the passing lanes to force the man on the ball to either make a run himself or play the ball backwards; or most rewarding – and most dangerous – an all-out assault on the man with the ball. Liverpool achieved great success with a high press in the 2013/14 campaign, and Southampton used it to great effect last season. But gegenpressing goes beyond a simple high press. It is a high-intensity, physically demanding way to play football – and it doesn’t stop. Unlike the high press which is effective in short bursts especially at the beginning of a game or in its final stages, gegenpressing is a full-match tactic, require players to give 100 per cent from opening kickoff to final whistle. And that might be a problem. Liverpool have some true grinders, players who never seem to tire out no matter how hard they run. Jordan Henderson earned the captaincy for his tireless play, and Emre Can also seems to always have something in the tank. But for many of Liverpool’s top players, fitness is an issue. Sturridge and Benteke have had struggles with injury and high-intensity play always increases the risk of injury: ask Klopp’s former Dortmund stars Marco Reus and Ilkay Gundogan. Meanwhile Adam Lallana and Philippe Coutinho have consistently proven they lack the stamina to play at full capacity for 90 minutes at a time. But that’s where the time comes in. Liverpool aren’t where they want to be, but they aren’t exactly in trouble either. They sit 10th in the Premier League, with 12 points from eight matches. But they’re just six points removed from Arsenal at the top of the league with over 75 percent of the season remaining. That means that Klopp, who led his first training session at Melwood on Monday with a depleted side while most of the starting contingent were away on international duty, has a period of time in which to instill in his players that hard-working, counter-attacking brand of football: an identity. It’s not likely we’ll see gegenpressing on Saturday against Tottenham Hotspur at White Hart Lane. It’s not likely we’ll see it against Southampton at home a week later. It isn’t even necessarily likely that we’ll see it against Chelsea at Anfield on Halloween. But there’s a chance we will. That match against Chelsea will be a massive occasion for the Reds. A chance to avenge a defeat that cost them a championship 18 months ago comes at a time when Chelsea are reeling: the defending champions have endured a terrible start under Jose Mourinho, who’s now facing the same criticism levelled at Rodgers during his final season at Liverpool. A victory for Klopp’s boys – especially if it results from tactically outplaying Chelsea with gegenpressing – could well be the turning point in Liverpool’s season. And after a less that stellar start, that’s exactly what Liverpool need. The 2015/16 Barclay’s Premier League season is just days away, and while the spending and the speculation are far from over, the countdown clock to opening day is all but spent. The big boys will fight for glory and the minnows will fight for survival, and to kick off the 2015/16 season preview, The Starting Point takes a look at the clubs to watch in the hunt for glory this season, courtesy of Premier League analyst Greg Hudson. 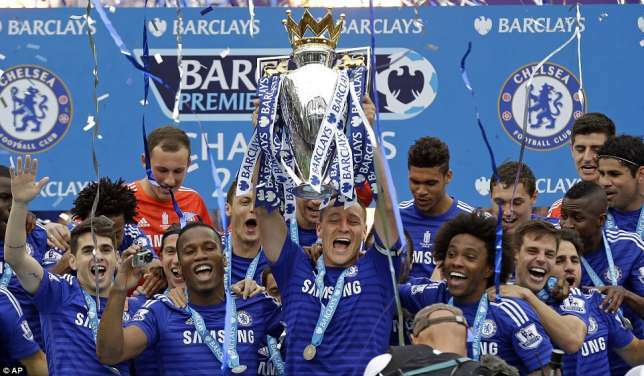 Club to Win it All: Chelsea F.C. Jose Mourinho’s men won it all last season, and there’s no reason to think they won’t do it again in 2015/16. They have a seemingly irresistible mix of solid defense anchored by John Terry, quality midfield play in the likes of Cesc Fabregas and Oscar, and clinical attack through Eden Hazard and Diego Costa, and that makes them a danger on their worst days, and a juggernaut on their best. The summer has been fairly quiet at Stamford Bridge, with the biggest activities being the departures of backup goalkeeper Petr Cech to Arsenal and the return of defender Felipe Luis to Atletico Madrid after an unremarkable year with the London side. But the relative quietude for Chelsea is more a sign of their confidence than of a lack of initiative. It’s often said that champions who don’t improve don’t remain champions very long. It’s true, but although they haven’t added to their squad, this is a fairly young group of players – goalkeeper Thibault Courtois, defender Cesar Azpilicueta, midfielders Oscar and Nemanja Matic, and both Hazard and Costa are still at-or-before their prime – and they’ve spent the summer gelling into an even better side. A 1-0 setback in the Charity Shield to Arsenal won’t bother them much: they’re still the favorites to win the title – and for good reason. 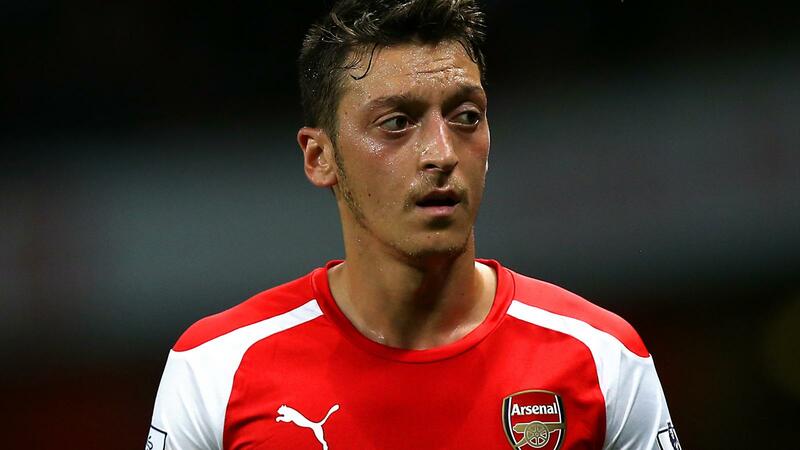 Dark Horse Title Contenders – Arsenal F.C. Arsenal were the in-form team of the second half of last season, and they’ll look to continue that hot streak in 2015/16, as star forward Alexis Sanchez begins his second season with the club and home-grown talent Francois Coquelin and Hector Bellerin look to become staples in the fiber of the club. The biggest action of the summer was the acquisition of goalkeeper Petr Cech from Chelsea, and while he’d been supplanted at Stamford Bridge by young hotshot Thibault Courtois, expect Cech to step right into the Arsenal squad between the sticks and make an immediate impact for Arsene Wenger’s side at the Emirates this season. Goalkeeping was Arsenal’s Achilles heel last term, as both Wojciech Szczesny and David Ospina failed to really bolster the defensive unit. With Cech in goal, Arsenal can fully commit to the kind of attacking play that saw them finish third last season. That gives the likes of Mezut Ozil and Aaron Ramsey the confidence to get forward and help Sanchez, Danny Welbeck and Theo Walcott with the goals Arsenal need to mount a title challenge. Most Overrated Club – Manchester United F.C. Yes, yes, I’m on the Hate United bandwagon. But not really. If you look at Manchester United, you see the single most imbalanced team in all of European football – world class attacking talent in front of a back line with no true leader and a goalkeeper whose days at Old Trafford are numbered – and that number is alarmingly small. There’s no denying that United have some world class attacking ability. Even with the departures of Angel di Maria and Robin van Persie, the Red Devils still have Wayne Rooney, Juan Mata and Ander Herrera helping create magical moments on the pitch. So when I looked at Man U’s situation at the end of last season – particularly given that they’d be returning to European competition in the Champions’ League – I assumed their top priority would be defensive strength. With Mats Hummels strongly linked to Old Trafford and Chelsea’s Petr Cech available to replace goalkeeper David de Gea, whose move to Real Madrid is somewhat of a foregone conclusion, it seemed compulsory that United make the move to bring world class defending to the Theatre of Dreams, in a necessary attempt to improve a side which allowed five goals to Leicester City last season. But they didn’t. The only defensive move the team has made has been the addition of fullback Mateo Darmian, which was followed with the departure of long-time right back Rafael. Instead, the side have brought on Morgan Schneiderlin and Bastian Schweinsteiger to improve the midfield, and world-class winger Memphis Depay to add to the goals department. But where is the defense!? It’s a question manager Louis van Gaal has ignored, or else he’s lost the memo. When your top defensive unit includes Chris Smalling, you’re in big trouble. And with de Gea gone in the coming weeks, there’s no way United can mount a serious title challenge. If you want proof that an all-attack-no-defense system doesn’t win the title, just ask Liverpool: they came about as close to pulling it off two seasons ago before it all unraveled at the finish line. Don’t be looking to see Manchester United at the top of the pile this season – unless they make some serious moves between now and deadline day. Most Underrated Club – Liverpool F.C. Two seasons ago, the Reds came as close to winning the title as a team can come without a solid defensive unit. Sadly, two years later, that defensive unit hasn’t improved much. But Brendan Rodgers has a much more all-around team now than he had in that (un)forgettable campaign in 2013/14. The likes of Adam Lallana and Lazar Markovic are beginning to come into their own, and Emre Can looks set to finally make a difference for Liverpool in his natural position in midfield. Yes, the team has lost three of its core players in the last 13 months in Luis Suarez, Steven Gerrard and Raheem Sterling. And yes, last season was an unmitigated disaster with Mario Balotelli proving perhaps the transfer blunder of the season and Daniel Sturridge finding the net just four times as he missed three quarters of the season through injury. But the Reds still managed to finish sixth for Rodgers and the Anfield faithful, and another summer of spending has again highlighted Rodgers’ smart mentality. Joe Gomez is a top defender of the future, and while he’s unlikely to make a big difference now, Nathaniel Clyne is a top fullback and his addition to the back line will make an immediate impact, both at the back and going forward. Roberto Firmino will partner well with Philippe Countinho in the attacking midfield, and young Jordan Ibe will feature a lot in the side after making some breakthrough performances in the preseason. But the move of the summer was the addition of Christian Benteke, a man whose numbers at Aston Villa nearly mirrored those of Luis Suarez in his time with Liverpool and whose strong attacking presence will surely help the Reds with their biggest problem from last term: goals. They aren’t title contenders. They simply aren’t that quality a side yet. But this is a predominantly young team, one of the youngest in the league, and the talent and creativity is undeniable. Of all the teams that failed to finish in the top four last year, I rate Liverpool as most likely to do it this season. Stay tuned to The Starting Point for more of Greg’s preseason thoughts as he looks at teams who will be fighting for their Premier League futures in the upcoming campaign – and who might just make it out alive. In a sign of how quickly fortunes can change in the Premier League, Liverpool find themselves seven points adrift of a Champion’s League spot after suffering their second consecutive defeat on Saturday, the most recent a 4-1 drubbing at the hands of Arsenal. For much of 2015 Liverpool have looked like one of the better teams in England, going unbeaten into the calendar year until their lost to Manchester United just before the international break. And yet despite that loss to Manchester United, fourth placed still seemed a distant possibility granted they came out and got a result against Arsenal. Now with back-to-back losses to their closest rivals in the chase for Champion’s League football, even Brendan Rodgers admits finishing in the top four now seems a distant possibility. “We require a lot of luck for us to win all the games, but we can still do it but it’s highly unlikely,” remarked Rodgers after his side’s latest defeat. However unlikely it may be, Liverpool still have 21 points to play during the stretch run of the EPL season. Given their recent form, it’s anyone’s guess how close they get to their number, but it is interesting to note that Brendan Rodgers set a target of 74 points earlier in the season as the total amount of points his team would need to get to ensure Champion’s League football. 21 points would give Liverpool 75 points to finish the season, but with Arsenal and Manchester United distancing themselves in the race for the top four, it remains to be seen if Rodgers’ benchmark will be enough. In the lead up to Saturday’s match, Rodgers called their match against Arsenal a “must-perform” game, and while today’s performance left much to be desired, every game from here on out transforms from “must-perform” to must win. We’re two-thirds of the way through the 2014/15 Barclay’s Premier League season and things are heating up at the top of the table – and the bottom – as the fight for Premier League glory – and survival – hits the home stretch. At the top, Chelsea (60 points) hold a five-point lead over defending champions Manchester City (55). The real fight lies between positions three through seven, where Arsenal (48 points), Manchester United (47), Southampton (46), Liverpool (45), and Tottenham Hotspur (44) are separated by a total of four points. Meanwhile, at the bottom, Leicester City are four points from safety with 18, while Burnley, Aston Villa, and Queen’s Park Rangers are knotted at 22 points apiece. Starting Point’s Greg Hudson takes a look at who he thinks will earn a place among the elite, who will fall short of glory, and who will find a way to survive the most challenging league in world football. The Gunners have been a consistent side this season, scoring goals with their mobile, free-flowing offense. They haven’t always been in the top four, but they haven’t always been fit either, as injuries to Aaron Ramsey and star forward Alexis Sanchez have hurt their form at times, but Arsenal have looked strong throughout the campaign. Defensively they’ve been strong and have played well against teams that like to play a physical game, and while their zonal-marking scheme at set pieces is an achilles heel, they aren’t easy to beat, and I’ll pick them to finish in the top four. The Reds came oh-so-close to winning their first league title in a quarter century last season, and the departure of Luis Suarez and the addition of several new players meant they were never likely to challenge for the title this season. A slow start and injuries to Daniel Sturridge and departing captain Steven Gerrard have left them without a star player at times, but the team as a whole is progressing well. They’ve lost just one of their last 18 games in all competitions, and that was an extra-time defeat to Chelsea in the League Cup, and new boys Adam Lallana, Alberto Moreno and Lazar Markovic have been weighing in with needed goals as the Reds offense has found its feet. Meanwhile, the shaky defense that cost them the title last year has come into its own with a new formation, and the Reds defense has kept a clean sheet in five of their last six games in the league. I think they’ll overcome the slow start and book themselves a place among Europe’s elite with a top-four finish. Make no mistake, Southampton are the surprise of the season. They’re a team that many picked to be relegated this year after so many of their key players left for higher places, but the “replacements” brought in by Ronald Koeman have not only filled their shoes – they’ve improved the side. Saints always looked like a team that could beat anybody on the day, but this season their fearless style of play and high-pressure defense has seen them sit as high as third. They’re on the outside looking in at the moment, in fifth, but wins over Arsenal and Manchester United should give them confidence as they head into the final push for the top four. That being said, they players at Koeman’s disposal aren’t used to the kind of pressure they’ll face in the fight to the finish this season. They simply haven’t been in this position before. A 2-0 loss at home to Liverpool offers evidence that perhaps they just aren’t quite there yet. I think they’ll fight hard, but I think they’ll come up just short. 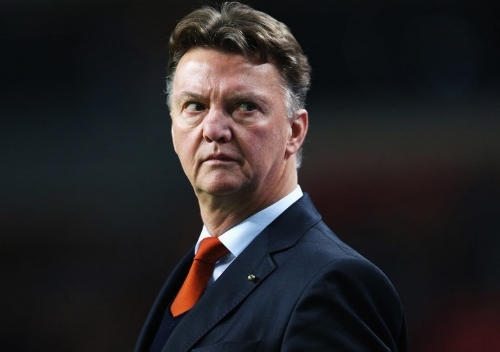 United have responded well to new manager Louis van Gaal, but they’re a very unbalanced team. They’ve put on some great performances this season, including a 3-0 home win over top rivals Liverpool, but they’ve also suffered a 5-3 defeat to Leicester City, who currently sit bottom of the league, and have been beaten for a double by Swansea, losing both games by a 2-1 margin. The simple fact about the Red Devils is that they’re a team of very talented attackers – Rooney, Di Maria, Mata, van Persie and Falcao are household names across Europe and South America – but a team who’s standout defender is Chris Smalling is doomed to failure. I’m not knocking the man, but a team that has aspirations of greatness in domestic and international competitions needs world-class defenders as well as attackers. They don’t have that at this point, and a failure to bring in any new men at the back during the January transfer window indicates that van Gaal or the United board simply don’t understand the severity of the situation. I don’t think they’ll finish in the top four, since good sides like Liverpool and Arsenal will take a lesson from Swansea and exploit the huge achilles heel United seem to ignore, and the Red Devils will have a lot to answer for when that happens. The Tigers struggled immensely over the Christmas period and fell as low as 19th in early February. But new signing Dame N’Doye has given the Tigers a spark, and it’s taken a lot of pressure off their other big man, Nikica Jelavic. N’Doye has weighed in with goals in both his starts, and Jelavic has found the target as well, helping the Tigers to back-to-back wins for the first time this season, and seeing them go four points safe. The form isn’t permanent but their fighting spirit and an improved performance at home suggests that Hull City will not fall victim to the sophomore drop the way they did in their first Premier League visit. I’ll pick them to beat the drop, not necessarily in easy style, but I think they’ll stay up at least another term. They’re right where they’ve spent most of the season: in the drop zone. But they’re a side that fights, and their 1-1 draw at Chelsea at the weekend is an example of it. They were on the road against the league leaders, but when given a man advantage after Nemanja Matic was sent off, the Clarets pulled level, and they’ve got the players to get the goals they need to survive. Youngster Danny Ings is one of the highest-scoring Englishmen in the league this term, and fullbacks Ben Mee and Kieren Trippier have been effective at supplying him. Ashley Barnes and Sam Vokes have been valuable attacking assets as well, and Tom Heaton has done his part in net, as the Clarets look for survival. I think they’ve got the fight they need, but unlike Leicester City who embody that same spirit, the points suggest Burnley might just live to fight another day in the league. The Hoops are an weird bunch. They have name – good names – filling their team sheets each week, but the results they’ve earned hardly reflect the talent. The simple fact about Rangers is that they’re a team without a purpose. Watching them play, they lack spirit, they seem to believe that they’re going to lose before the opening kickoff, and once they fall behind there’s not much getting back into the game. Charlie Austin is the league’s highest-scoring Englishmen, and he’s just been given no support. Bobby Zamora and Eduardo Vargas have provided sparks of intensity from time to time, but the Hoops just don’t connect. They’re all on different pages, and a book that isn’t in the right order ends up at the bottom of the stack, which is where QPR will finish: in the drop zone. The Villans have the players and they have the money. But they don’t have the quality. They’re a collection whose whole has yet to equal the sum of its parts. They’ve lost their last six in the league, and they’ve fired manager Paul Lambert two thirds of the way through the season. Norwich City tried it last year, hoping it would give them a spark that would ignite a resurgence. It didn’t work, and the move is typical of desperation that’s setting in at Villa Park. They sit 19th and boast the league’s worst defensive record. It wouldn’t be so bad if the offensive weapons at interim manager Tim Sherwood’s disposal could find the net, but since the new year they often appear as if they don’t know what the goal looks like, let alone how to put a ball in it. They’ve failed to score in four of their last six, including matches against Hull City and Leicester. Their inability to beat the teams around them in the table bodes very ill indeed for a team that’s one of just seven never to be relegated from the Premier League, and I expect we’ll be watching a league without the Villans in 2015/16. The two clubs at the summit of the Premier League put in two contrasting performances over the weekend as Chelsea cruised to 5-0 victory over Swansea, while Manchester City struggled in their 2-0 defeat to Arsenal. After a 5-3 defeat to Tottenham to start the new year, Chelsea now seem poised to put their recent lackluster run of form behind them, having now kept back-to-back clean sheets in the Premier League and netting a combined 7 goals against Newcastle and Swansea City respectively. 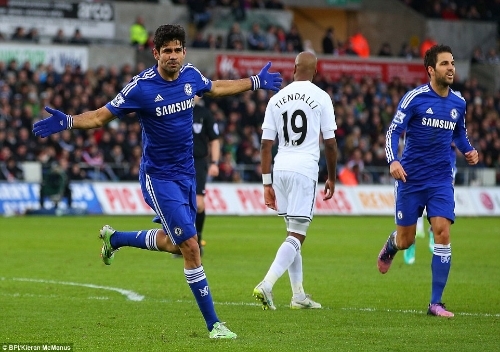 Saturday’s win over Swansea was everything we’ve come to expect from Jose Mourinho’s side on both sides of the ball, as they took the lead just 48 seconds in behind a goal from Oscar and rode a sublime performance from Diego Costa en route to victory. Saturday’s win over Swansea took the Blues five points clear of Manchester City, who themselves could not muster a result against an Arsenal team that has quietly won 5 of their last 7 Premier League matches. The return of Vincent Kompany was thought to give City a boost going into the match-up, but the Belgium international showed rust throughout and personified an unimpressive day for the City defense. With Arsenal striking for goals on either side of the half, City were unable to find a breakthrough despite enjoying a healthy amount of possession. With their unbeaten streak of 12 snapped, and their midfield engine Yaya Toure away on international duty, all eyes will be focused on a January 31st clash with league leaders Chelsea, which has the potential to see Chelsea move eight points clear of their nearest threat to the Premier League crown. Louis Van Gaal has long admitted that Manchester United remain a work in progress despite sitting fourth in the Premier League, and Saturday’s 2-0 win over QPR showed his squad still have much smoothing over to do before they are a finished product. For a majority of the first half, QPR looked much the more threatening side in carving out better chances of the two squads. United, who rolled out a 3-4-1-2 formation to start the match, showed they still have yet to achieve a comfort level using three at the back and looked much better once Van Gaal went to a more orthodox back four in the second half. Goals by Marouane Fellaini and James Wilson were enough to allow Manchester United to pick up the three points, but they have still yet to click going forward with all of their expensively assembled attacking options. Radamel Falcao put in decent shift against QPR, but his scoring touch has yet to make its way to Old Trafford as he could not find the back of the net despite having at least two clear-cut chances at goal. Falcao was partnered up top with Angel Di Maria, who Van Gaal continues to experiment with up front as a forward to mixed results at best. Di Maria works best centrally or out wide were he can take advantage of his blistering pace to move past defenders to go either on goal or set-up teammates. When you pay close to $100 million dollars to bring in Di Maria you have to maximize his strengths, and playing with his back to goal or dropping deep just doesn’t allow him to impact the game in ways we’ve become accustomed to seeing. In the end, it’s hard to argue after a club takes home three points, but if this result is any indication Van Gaal will remain the mad scientist tinkering for answers, while United remain a work in progress. A recent run of 16 points out of a possible 18 have Southampton sitting third in the Premier League table and bunkering in for what will be a season-long push for Champions League football at St. Mary’s Stadium come next season. Recent loan signing Eljero Elia repaired the Saints gratitude as he scored his first two goals for the club to help take them past Newcastle 2-1. Despite missing both Morgan Schneiderlin and Victor Wanyama from their starting 11, Southampton never seemed as though they were ever truly threatened in the match by Newcastle, who themselves suffered their third defeat in four games. It seems like only yesterday questions surrounded Southampton and their ambitions to field a competitive club after selling off the likes of Luke Shaw, Adam Lallana, and a host of others, and yet week in and week out they continue to defy expectations and make us all of wonder if they have yet to even played their best football this season. Whether or not Southampton can this up and see out the season in one of the four Champions League spots remains anybody’s guess, but with matches against Crystal Palace, Swansea City, and QPR all looming on the horizon, one has to fancy their chances to at least ride this wave of incredible form for the foreseeable future. Who’s Hot ? Whose Not ? Chelsea: Jose Mourinho’s men have gotten off to one of the hottest starts in Premier League history, winning ten of their first 13 contests and going unbeaten. Their free-flowing and creative attack has belied Mourinho’s reputation as a defensive-minded manager, but the defense has been almost unbreakable all season. They sit atop the league by six points over champions Manchester City and frankly don’t look like they can be caught at this point. It’s a foolish thing to say at such an early point in the season, with so much time remaining for players to lose their form or suffer the injury bug, but all signs point to a reality that anyone wanting to win the title this season will have to do so over Chelsea’s dead bodies. Southampton: The Saints were almost everyone’s – including my own – favorites for relegation after Liverpool and other top clubs raided the club of its best talent during the summer transfer window. But Southampton have not only replaced them, they look like an improved side for it, with new striker Graziano Pelle benefitting from excellent link-up play from new winger Susan Tadiç. Saints currently sit third in the table and based on current form, could put up a good fight for a spot in the Champions’ League next year. Manchester City: Last year’s champions won’t be pleased with their performance so far this season. It’s almost unfair to say that the team which sits second isn’t hot but they simply haven’t lived up to expectations as the most talented group of players in England. They’ve been too reliant on Sergio Agüero for goals and their once-solid defense has at times looked porous. They’re only six points behind Chelsea but based on current form they might as well be 12 points back because they have their work cut out. Liverpool: Like City, the Reds came down hard off a great season. They lost superstar striker Luis Suarez to Barcelona and invested in several good players but they simply haven’t meshed yet, and with star striker Daniel Sturbridge out since the end of August, things have looked dire for Liverpool who have just 17 points and sit 11th. It is very reminiscent of Tottenham Hotspur last season, when they lost Gareth Bale and struggled to find chemistry with the seven new players they signed. The good news for the Reds is that Spurs look strong a year later, and so while this season isn’t set to amount to much, improved form next season could see them again return to a fight at the top.